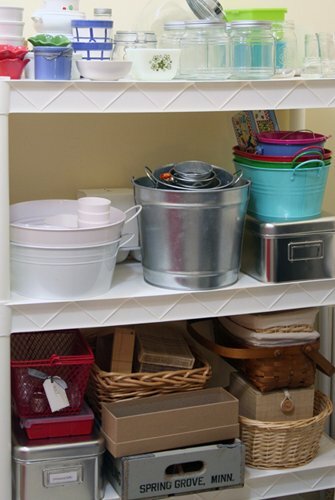 The right storage solutions are an essential component to any organized space. Primary storage pieces such as bookcases, desks, shelves and drawer units allow you to perform the tasks that the space is designed for and give homes to the items used and stored in the room. Likewise, secondary storage pieces such as bins, baskets and drawer organizers make your space even more functional and attractive. When it comes time to add storage to your scrapbook room, keep in mind that you can get a lot of bang for your buck when you exercise your creative organizing muscles. 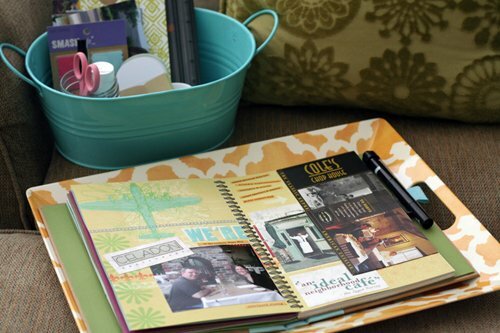 Use these scrapbook storage ideas to make your scrapbook room as creative as your scrapbooks. You’ll give your wallet a break and give yourself the chance to truly express your personality, style and creativity in your space. Ahead are seven ideas to help you think outside the box—or beyond the plastic storage bin and wicker basket—when adding storage to your creative space. 1. Freshen up your containers with decoupage or spray paint. For just a few dollars in decoupage medium or spray paint, you can transform plain containers, like recycled boxes or wooden drawers, into works of art. When decoupaging, raid your stash of fabric or patterned paper—and select patterns and colors you love. Or use a single, favorite color of spray paint to unite a mismatched collection of containers. 2. Use custom storage solutions sparingly. Storage solutions designed specifically for crafters can carry a hefty price tag, so use them sparingly to stretch your storage budget. In the long run, you’ll save money when you invest in more generic storage solutions that can be used in a variety of ways. For example, instead of purchasing a binder with customized inserts for your 12 x 12 stickers, consider a 12 x 12 photo album with standard sheet protectors. Or store your stickers vertically in a rectangular bin. Basic containers like bins, baskets and buckets can corral items in your creative space today, and then, when your storage and organizing needs change, you can repurpose these containers for use in other areas of your home. 3. Use everyday household items in new ways. Before hitting any store and spending money on storage solutions, shop at home first. You just might be amazed at what you have hiding in your kitchen cabinets, on garage shelves or hanging in your closet, waiting to be put to use in new ways. In fact, my favorite organizing projects are ones where I get the chance to use existing items—in my own home or my clients’ homes—in new ways. Here are some of my favorite items to repurpose for storage. Bowls, ramekins, mini loaf tins or muffin tins. All of these make terrific drawer organizers for small craft items. Or use colorful ceramic bowls to add a pop of color to a bookcase or desk top while corralling note cards, journaling cards or other small items. Galvanized buckets. Buckets make stylish catchalls for punches, pens, colored pencils, paint brushes, etc. If you want, you can spruce standard metal buckets up with a can of spray paint. Glass votive holders. Clear glass votive holders are terrific for storing decorative clips, tags, buttons and small journaling cards. Line them up on a narrow shelf above your work surface to keep supplies in sight and handy. Toolboxes, tackle boxes and ammo boxes. 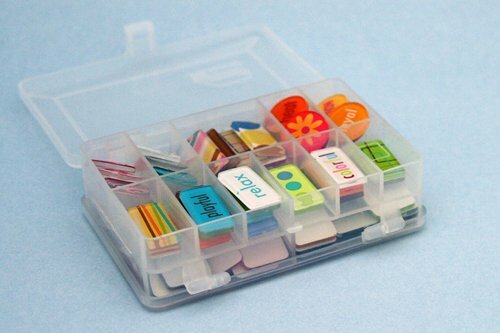 Consider these terrific, portable organizers for your basic tools and small embellishments. Tackle boxes are perfect for storing small supplies, like beads, brads, eyelets, buttons and charms—any small item that you want to store by color, size or type of item. 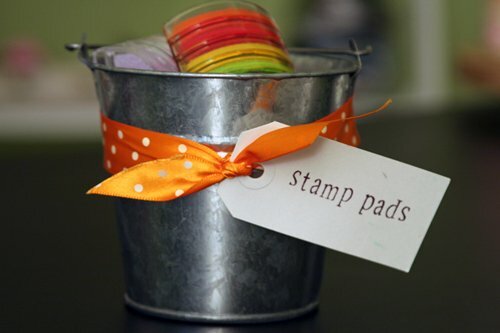 Or use small ammo boxes for storing small letter stamps and other tiny embellishments. Serving trays. Trays can be used as a temporary work surface when creating on the couch or in front of the T.V. Plus they’re handy for storing supplies horizontally on narrow shelves or for transporting items to and from your storage area to a temporary creating area. Lunch boxes. Vintage metal lunch boxes add a retro touch to your creative space, and make for a handy, portable place to stash basic tools and supplies. Create a container station. When you find vessels that could be re-purposed as storage, create a container station—a single spot in your home to store your potential storage pieces. My container station is set up on a shelving unit in my office closet. Then, anytime I need a container for an organizing project—my creative space or elsewhere—I simply visit my in-home container store. It’s a great system that makes organizing more fun. Give it a try in your home! I hope your creative organizing juices are flowing now and that your head is spinning with creative organizing ideas of your own. If so, get up and take action now! Go on a quick tour of your home and pull out potential containers you could use to add storage—and style—to your creative space. Thanks, Glenda! Glad you enjoyed it. love the idea of using containers in other ways. The ribbon and tags makes it look so cute, what a great touch. wanted to leave a comment – since I saw you had one from a glenda – i encourage any other glenda / glynda / glinda’s to leave a comment. Thanks for your comment Glynda. I love the idea of labeling & creating an area to store all of those neat containers we find, but are not quite ready for yet. I keep my in a box in the garage, but have never thought of it as my ‘container store’ area. I love that this ideas gives it REAL purpose in my life. Yay for giving your collection of containers real purpose in your life. It does make a difference, doesn’t it? Great idea to re-purpose those buckets! I love the idea of a container station–I have a variety of items saved for this purpose, but they are scattered throughout the basement shelves, closets, etc. Great idea to corral them together!